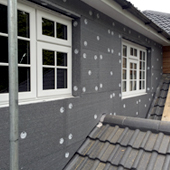 Homeshield can fit a complete or partial External Wall Insulation (EWI) to your home. If your home was built before 1919, its external walls are probably solid rather than cavity walls. Cavity walls are made of two layers with a small gap or 'cavity' between them. Solid walls have no gap, so they let more heat through. Another way to tell is by measuring the width of the wall. Look at an external wall window or door and if the brick wall is less than 260mm (c.10.5 inches), then it is likely a solid wall, while if it is greater, it is probably a cavity wall. If you live in a house that has a non-traditional construction, such as a concrete, steel or timber-framed building, insulating will be different. 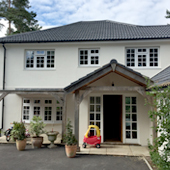 Solid walls can be insulated – either from the inside or the outside (EWI). This will cost more than insulating a standard cavity wall, but the savings on your heating bill through insulating your solid walls could cut your heating costs considerably, because solid walls let through twice as much heat as cavity walls do. About a third of UK homes have solid walls, according to the National Insulation Association. It estimates that 45% of the heat from these homes could be escaping through walls. External Wall Insulation can also reduce 'cold spots' and hence alleviate condensation. 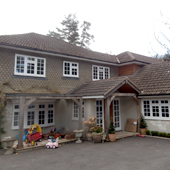 Aesthetically adding an EWI system can totally transform and modernise the look of your home. 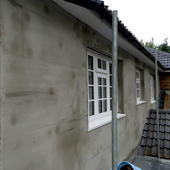 External insulation involves fixing an insulating material to external walls with a protective render/coating or decorative cladding over the top. The thickness of the insulation needs to be between 50mm (2 inches) and 100mm (4 inches). It's usually installed when a building has severe heating problems or already requires some form of repair work that provides the opportunity to add insulation. Decorative coatings can be used to improve the appearance of the outside of your home. External insulation can also match a wide variety of home designs, such as Georgian, Victorian and Edwardian-style properties.